The Mio Motion heart rate monitor is a strapless heart rate monitor with ECG accurate measurements and a pedometer all in one single unit. It is part of the new Smart Touch series from Mio. It uses the new Smart Touch technology to measure heart rate on demand, so now all it takes is to place one finger (not two) on the palm sensor and wait for a few seconds for the heart rate readout. 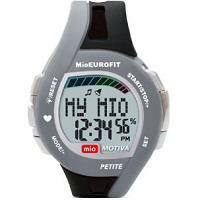 The pedometer functionality of Mio Motion counts steps and calories, and measures speed and distance. Note that there is a variant for larger wrists: Mio Motion +. The Mio Motion + has the exact same features as Mio Motion. The other variant of Mio Motion is the larger Mio Motion + as shown below. The most interesting thing about the Mio Motion is that it combines both heart rate monitor and pedometer into one unit. 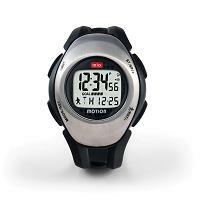 This is great for walkers and light joggers who now can track heart rate, step and distance information readily. Unlike many other strapless heart rate monitors, the Mio Motion utilizes Smart Touch, which requires only one finger (or any part of the palm) to be on the sensor for heart rate to be measured. That makes the measurement process easier. 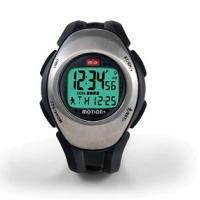 Mio Motion heart rate monitor also allows you to set a heart rate zone if desired. When you measure your heart rate, it will beep once when your heart rate is within the zone, and twice if it is above or below the zone. In so doing it reminds you to walk at the right pace and intensity. One of its great features is that you can review a host of relevant numbers while you are walking for instant feedback about how you are doing. During the set up phase, you should input several relevant personal data to ensure that the various calcuations are accurate. The data include birth date, gender, weight, height and stride length. Furthermore the sensitivity of the pedometer can be selected. There are two timers: count up and count down. Depending on your walking need, you can choose one or the other. The Mio Motion heart rate monitor is an interesting combination of strapless heart rate monitor and pedometer. It will appeal to walkers and light joggers and give them a host of useful information about their exercise.